We had a LOT of rain today. The good news is, the rain gardens worked (mostly). The bad news is, the basement foundation did not. We made a bit of a mistake building those large berms in our front yard without also building up the soil level around the base of the foundation; they directed water toward the house. Combine that with the contractor sealing the hole for the new waterline with an improper insulation, and you get quite a puddle in our basement storage area. The water was literally pouring in through the hole. We probably had about a half-inch of water in this front area. Strangely, our first thought wasn't to pull out the camera to take pictures, but to start hauling piles of boxes out of the way of destruction. These photos were taken several hours later, once the hole had been sealed with a hydrophobic seal (Hydrocrete, we think) and the water had been mostly vacuumed out of the basement. 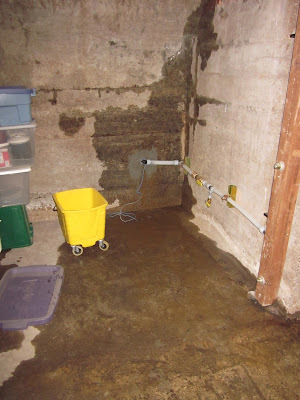 The quarter-inch of water in the back area in the basement (outside the bathroom) was pretty much self-inflicted. The channel across the driveway really doesn't work, perhaps because of the slope. The current plan is to actually dig a trench and install a pipe that diverts the water to the backyard. That hasn't happened yet. Jeff probably has an unfun, muddy week in store. Ugh, I'm so sorry! Now I understand what you meant about them "mostly" working.